Hawaiian Volcano Erupts As Molten Lava Flows Into Residential Neighborhoods : The Two-Way The U.S. Geological Survey said lava was spewing into a neighborhood near the Kilauea volcano, which briefly erupted Thursday, and that a 6.9 magnitude earthquake was reported in the area. A new lava vent opened up on a residential street in the Leilani Estates neighborhood near Kīlauea volcano Friday morning. Spatter was being thrown nearly 100 feet high at the time the photo was made. A day after Hawaii's most active volcano briefly erupted, triggering evacuation orders for some 1,700 people, lava has again started to flow. Earthquakes were reported on Friday, including a 6.9 magnitude temblor, according to the U.S. Geological Survey. The Hawaii County Civil Defense said at 2 p.m. local time that no tsunami was expected after that particular quake. USGS said earlier in the day that lava was spewing into a residential neighborhood near the Kilauea volcano, forcing any residents who had ignored the order and remained in the area to flee. 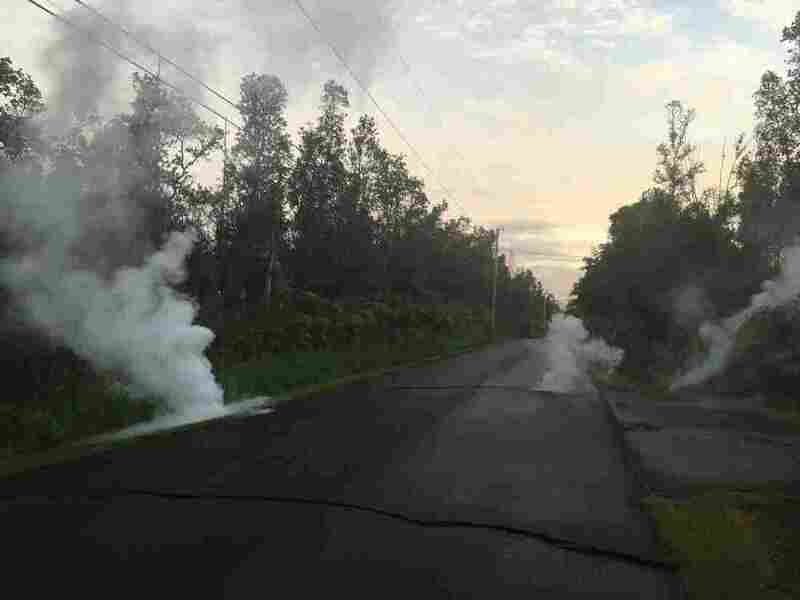 "Eruptive activity resumes from a new vent in Leilani subdivision on the Island of Hawaii," USGS tweeted at about 5:15 a.m. local time. An alert issued in a statement from the county civil defense agency about an hour earlier warned residents to get out immediately. Steaming cracks at 5:57 local time in Leilani Estates subdivision, moments before a fissure opened up on Kaupili Street. "Volcanic vents are erupting on Makamae and Mohala Streets, all Leilani Estates and Lanipuna Gardens Subdivision residents are ordered to evacuate immediately," civil defense officials tweeted. The agency also warned of "active volcanic fountaining." USGS video showed lava pouring out of the vents and flowing through swaths of dense trees, across roads and near homes. The vents were created by hundreds of small earthquakes that have jolted the region since Monday. Leilani Estates is about 25 miles from Kilauea and close to 30 miles south of Hilo, a popular vacation destination. Hawaii Gov. David Ige said residents in the area were being sheltered at Pahoa and Kea'au community centers. Resident Julie Woolsey told the AP she released her chickens, put her dogs in her vehicle and evacuated with her daughter and grandson on Thursday. "You can't really predict what Pele is going to do," Woolsey told the news outlet, referring to the Hawaiian volcano goddess. "It's hard to keep up. We're hoping our house doesn't burn down." The initial eruption Thursday afternoon, which was captured on video here, was short-lived and remained relatively contained. The Hawaii Observatory Status Report said "lava spatter and gas bursts" lasted for only about two hours and spread some 33 feet from ruptures in the earth. Geologists had predicted that the swarm of temblors — more than 600 in the past four days — meant that lava could break through the surface at any time. "The rumbling in the region goes back to mid-March when the cone of the Pu'u O'o crater on Kilauea began to swell and the pressure trapped inside caused the crater floor to collapse on April 30. That forced an intrusion of the magma, which means that rather than gushing upward through the crater of the volcano, it starting seeping underground. "As it moves beneath the surface, the molten lava is breaking up rock and causing the ground to shift. That process results in earthquakes. And the fear is that lava will spew out of cracks created by those earthquakes and destroy nearby homes." Hours before Thursday's eruption, a 5.0-magnitude temblor shook the area. The governor activated the Hawaii National Guard to assist emergency responders with evacuations and security. 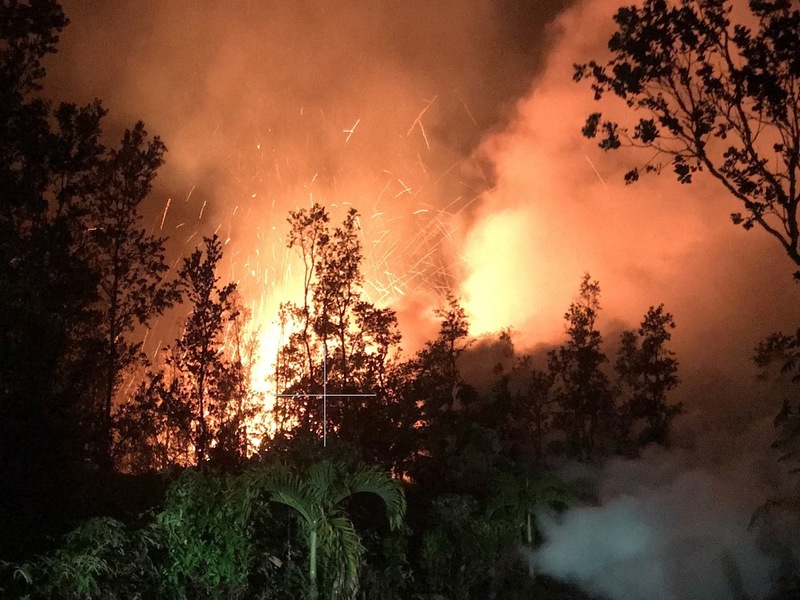 Ige tweeted Thursday night: "I am in contact with @MayorHarryKim and Hawai'i County, and the state is actively supporting the county's emergency response efforts. I have also activated the Hawai'i National Guard to support county emergency response teams with evacuations and security." Civil defense officials warned residents near Kilauea that "extremely high levels of dangerous sulfur dioxide gas," which can irritate the eyes, nose, throat and lungs, had been detected in the air. NPR's Nicole Hernandez contributed to this report.